Midget Whites are a breed of domestic turkeys named for their white plumage and small size. They are the smallest turkey breed, with toms weighing an average of 15 lbs and hens weighing 8 lbs. Midget Whites are a rare heritage breed classified as “Critical” by the American Livestock Breeds Conservancy. In recent years, Midget Whites have developed a reputation as a friendly, small-flock turkey with excellent food qualities, perfect for raising in backyards and on urban homesteads. To start your own flock of Midget White turkeys, you can order eggs, started birds or breeder adults. Our eggs are sold by the dozen and hatch after roughly 1 month. You can order started birds, which are 2 months old, and can be out on their own without caretaking by you or the hen. They reach full maturity after another 5 months. Breeder adults will reproduce and raise their young independently. It takes a total of 7 months for a turkey to reach full maturity after hatching. Midget Whites have an average lifespan of 5 to 7 years. 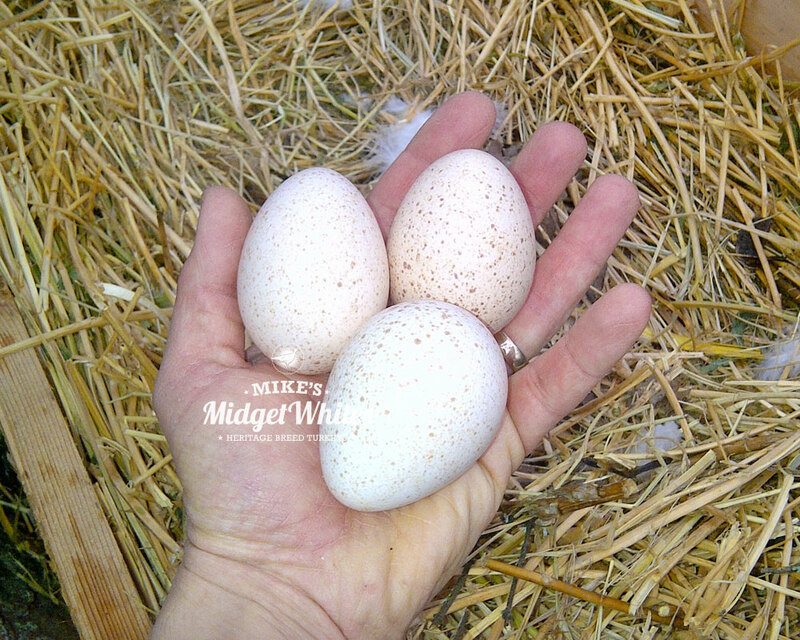 Mike Omeg actively manages his own flock of happy, hormone-free, free-range Midget White turkeys. He takes the best individual birds - the perfect Midget Whites - and breeds them using very selective criteria for body type, temperament, hardiness and meat quality. Mike improves the genealogical line of his flock each year, helping bring Midget Whites back from the edge of extinction and making them available for backyards and homesteads across the country. Mike is also the owner of Omeg Orchards, a family owned and operated cherry orchard in The Dalles, Oregon, since 1908.